Do you have a bunch of berries that you are not sure what to do with? 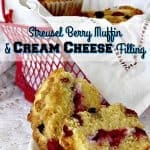 Check out this streusel berry muffin with cream cheese filling recipe! 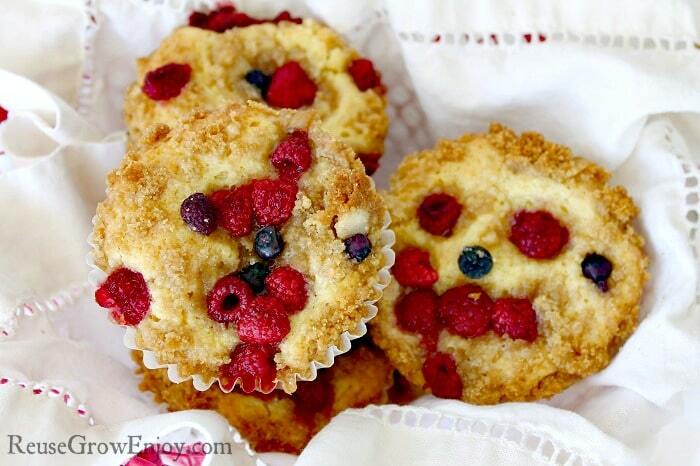 With this muffin recipe you can mix and match your favorite berries to create these delicious muffins, with the flavors that you love. You will be delighted with the variety of textures and flavors! 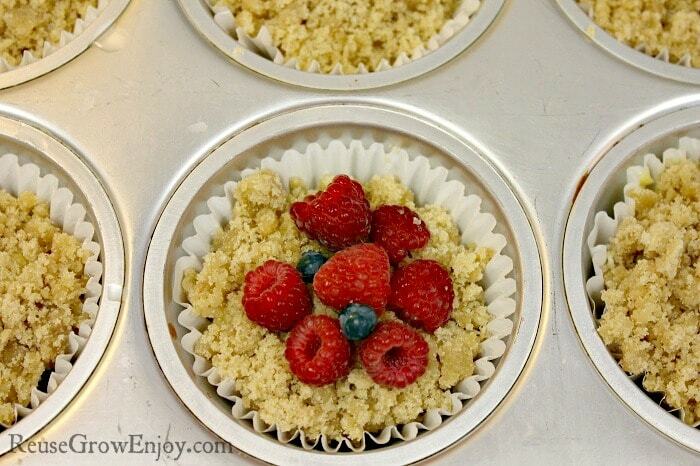 It has the smooth cream cheese filling, tart berries, and sweet crunchy streusel topping. Everything adds up to the perfect muffin! 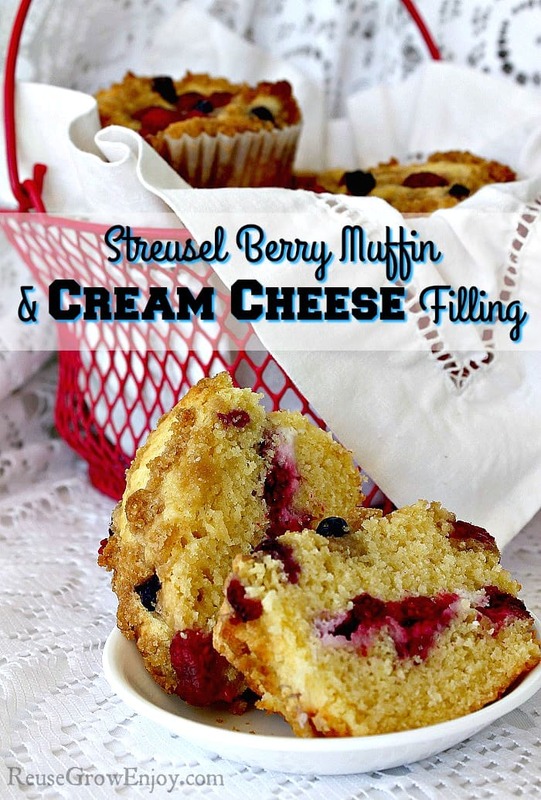 This streusel berry muffin can be enjoyed warm or cold. They also are a nice item to make up and wrap, toss in the freezer. Makes for a nice addition to a sack lunch. If you liked this recipe, here are a few others to check out. In a small bowl, beat together the cream cheese and sugar. Add the egg white and flour. Beat until light and creamy. Set aside. Make muffin batter: In a large bowl, combine the sugar, flour, baking powder and salt. In a small bowl combine the melted butter, milk, vanilla, and egg. Beat well and add to the dry ingredients. Stir gently, until combined. Don’t over mix. Line a 6-cavity jumbo muffin pan with paper liners. Put one heaping tablespoon of batter in each liner, leveling a little bit with the spoon. Divide cream cheese mixture between each cavity, spooning it onto the center of the muffin batter. Divide half of the berries between the 6 cavities, pressing them slightly into the cream cheese mixture. Divide the remaining batter between the 6 muffins, covering the berries. Smooth slightly, but don’t worry about getting the batter all the way to the edge. The batter and the streusel topping will fill in any gaps as the muffins cook. Combine the streusel ingredients and divide it evenly between the muffins, covering each generously. 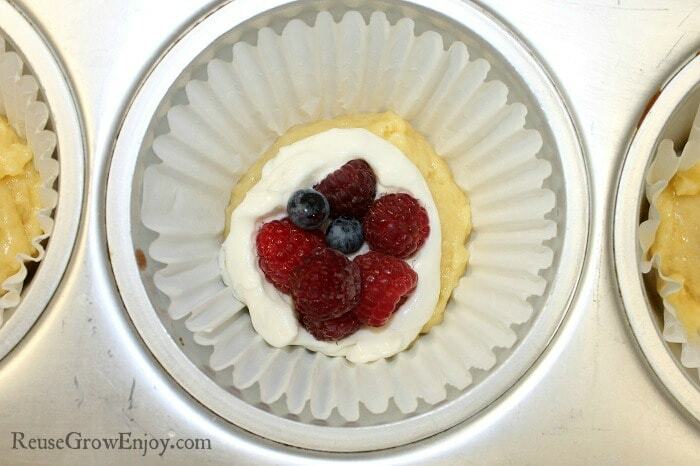 Add the remaining berries to the top of the muffins and bake for 25-30 minutes. Allow the muffins to remain in the pan on a rack for 10 minutes. Remove muffins from pan and allow to cool on the rack.